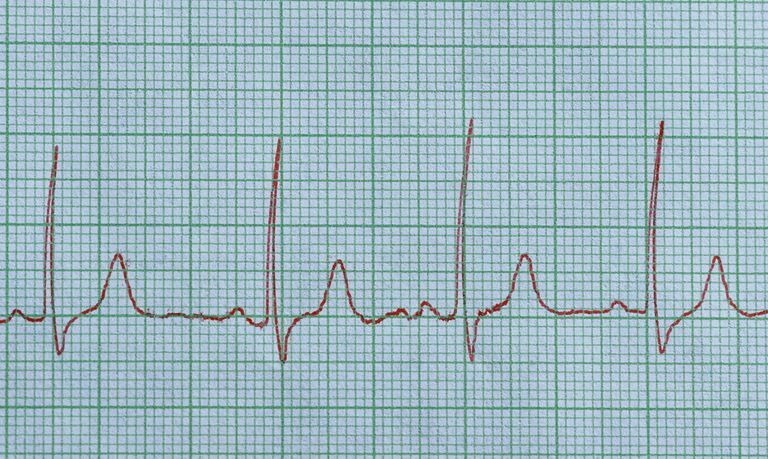 Normal sinus rhythm (NSR) is another name for the normal heart rhythm. The heartbeat is controlled by regular electric signals (also called an electrical impulse), which spontaneously arise in a structure called the sinus node, and which then spread across the heart (first across the atria, then across the ventricles). This orderly spread of the electrical impulse assures that the various portions of the heart contract in an orderly, sequential way. It assures that the atria beat first (thus ejection their load of blood into the ventricles), and only then do the ventricles contract, ejecting blood into the lungs (right ventricle) or the rest of the body (left ventricle). “Sinus rhythm” means that the heart’s electrical impulse is being generated in the sinus node, as nature intended. “Normal sinus rhythm” indicates that not only is sinus rhythm present, but also the rate of “firing” in the sinus node is normal—not too slow, and not too fast. Typically, normal sinus rhythm is defined as a sinus rhythm whose rate is between 60 and 99 beats per minute. Sinus rhythm may be slow, which is called sinus bradycardia. (Bradycardia is the name given to a slow heart rate.) Sinus bradycardia is not necessarily abnormal. During sleep, most people have heart rates that dip well below 60 beats per minute, and trained athletes often can have resting heart rates in the 40s. So the mere fact that sinus bradycardia is present does not mean there is a problem. However, sinus node disease (sometimes called sick sinus syndrome) often does produce symptoms because the heart rate is too slow. When this occurs, a pacemaker is usually required to relieve the symptoms. Sinus rhythm may also be fast, which is called sinus tachycardia. (Tachycardia means a fast heart rate.) Similar to sinus bradycardia, sinus tachycardia may be either normal or abnormal. Sinus tachycardia is supposed to occur, for instance, when you are exercising. The increase in heart rate allows the heart to pump the extra blood that the body needs during exertion. Similarly, sinus tachycardia may normally occur in periods of high stress, during fever, with hyperthyroidism, or when other kinds of medical problems are present that require a higher cardiac output (such as anemia). So, if unexplained sinus tachycardia is present, it is important for a doctor to do a complete medical evaluation to identify the underlying cause so that it can be treated. Rarely, a form of sinus tachycardia can occur which is called sinus re-entrant tachycardia. This is a type of sinus tachycardia that comes and goes suddenly (like turning a light switch on and off), that is caused by extra electrical pathways within the sinus node. It is usually treated with ablation. Some people have sinus tachycardia without any apparent underlying cause, a condition called inappropriate sinus tachycardia (IST). A similar condition is seen called postural orthostatic tachycardia syndrome (POTS), in which sinus tachycardia—and a drop in blood pressure—occurs in the upright posture. Both IST and POTS often produce significant palpitations, lightheadedness and other symptoms, and unfortunately, are often misunderstood (and misdiagnosed) by physicians. Bjerregaard P. Mean 24 Hour Heart Rate, Minimal Heart Rate and Pauses in Healthy Subjects 40-79 Years of Age. Eur Heart J 1983; 4:44. Yusuf S, Camm AJ. The Sinus Tachycardias. Nat Clin Pract Cardiovasc Med 2005; 2:44.